Open Day and Catalogue Launch Event this Sunday! Are you local to Whakatane, Kawerau, Opotiki, Matata, Pukehina, Rotorua and Te Puke (and wider areas) and have some time free this Sunday? Come and see me and some of my team at our Open Day and Catalogue Launch Party at the Arts Society Rooms cnr of Short st and McAllister st in Whakatane! We are open from 9.30am to 4.30pm. (you can just come anytime). Just $2 will get you a make n take card, a treat bag, door prize entry of products and a play with some of our new products from the new Annual Catalogue and Holiday Catalogue! Any orders on the day gets you another prize entry in another basket of new, new, brand new goodies! We will also selling catalogues on the day for $5 (for both the annual catalogue and holiday catalogue). You can also get one free if you host a workshop/party. 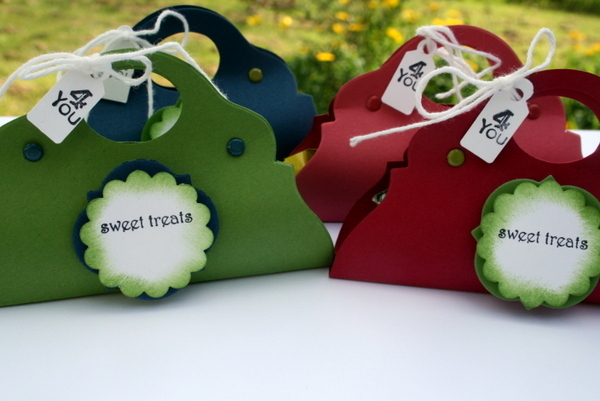 These are made from the Oval Accent Clear Bigz die (127005) on page 192 of the Annual Catalogue. Ive used 4 out of 5 of the new In Color colours for them. If youd like to book a party or workshop as we used to call them.. to make these as the make n take, then email me or see me Sunday. Thanks Delys, really enjoyed sunday, very inspiring, great to see all the new products, and what you have created with them already.